When it comes to water, England is the odd one out in that its water and sewerage services are privately owned. It is becoming more apparent that Margaret Thatcher’s privatisation of the water industry in 1989 has failed. As the leading trade union in the water industry GMB has had a close up view of the shortcomings of water privatisation. Pensions have been attacked, jobs have been outsourced and lost, health and safety has consistently deteriorated and the lack of investment is there for our members to see. These are symptoms of a fundamentally broken model which put incentives in all the wrong places. As a result, England’s nine water and sewerage services are focused on shareholders and those at the top - not the public, the workforce or the environment. 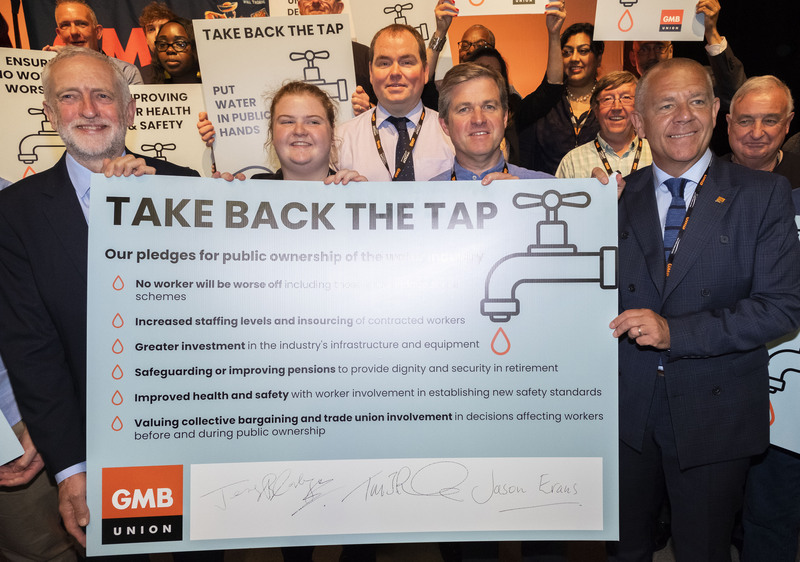 GMB has longstanding policy in support of bringing water back into public ownership, but our Take Back the Tap campaign has been boosted because it chimes with Labour’s manifesto commitment at the 2017 general election and the mood of the public. GMB was delighted that Labour leader Jeremy Corbyn supports our pledges to those working in the water industry so that no worker would be worse off from public ownership, pensions would be maintained or improved, investment in infrastructure would be increased, outsourced jobs would be brought in-house and trade unions would help have a say in improving health and safety standards in the industry and that collective bargaining would be valued. The corporate excess at the top of these companies is impossible to justify, yet this is what customers are paying for through their bills. Since privatisation in 1989, customers’ water bills have increased by 40% above inflation. The CEOs of the 9 water companies took home and average of £1.2 million each year which is six times more than the UK Prime Minister. It’s not just those 9 individuals who are paid at such a sky-high amount. The 54 most senior executives in England’s water companies took £175 million as a result of salary, bonuses, pension contributions and other benefits between 2013 and 2017. Our most recent research with Corporate Watch has revealed that shareholders have profited by £6.5 billion between the same five year period. Some of that could have gone towards tackling leakages, improving services and lowering bills – but instead it has gone into pockets of those seeking to profit from our water. As a country we have to decide who we want our water industry to really work for. Sadly, this won’t be the last hot summer as global temperatures continue to rise. Margaret Thatcher’s failed privatisation of the water industry has led to leaking pipes wasting a trillion litres of treated water a year, a reduced and fragmented workforce under intense pressure while executive pay is indefensibly high in a sector with no competition. Shareholders profit from higher bills while millions of customers face greater restrictions. We can’t carry on like this. That is why GMB will be continuing to campaign to Take Back the Tap and return England’s water services to its rightful owners – the public. Work areas: Economy and Industry. Tags: economic alternative, politics, privatisation, trade unions, workers rights.